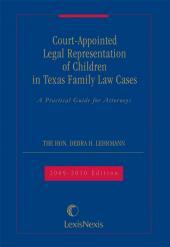 Court-Appointed Legal Representation of Children in Texas Family Law Cases, A Practical Guide for Attorneys, completely covers the Texas standards for court-appointed representation. 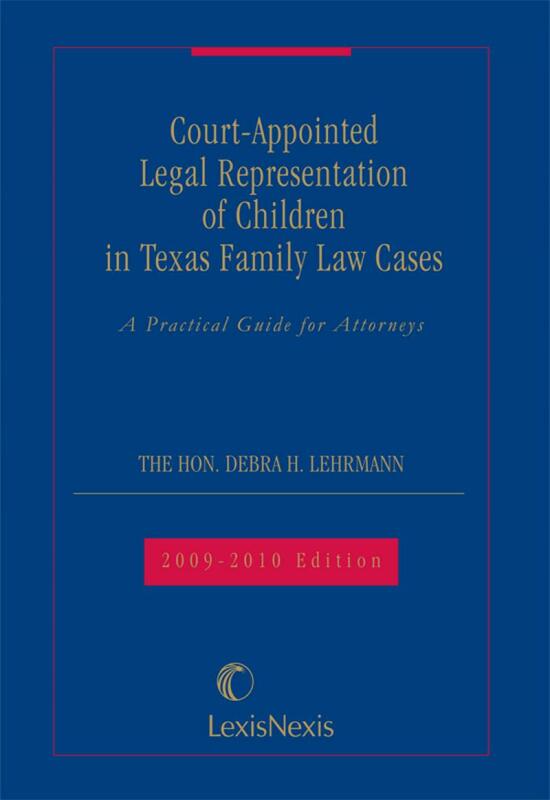 It includes a full discussion of the case and legislative history leading up to passage of the 2003 legislation that overhauled the Texas Family Code Chapter 107, as well as comparison with national standards adopted by the American Bar Association, the National Association of Counsel for Children, and the American Academy of Matrimonial Lawyers. 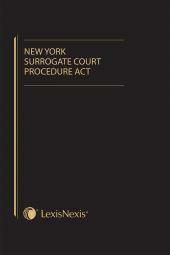 In this work, Judge Lehrmann also provides step-by-step guidance for each type of court appointment, whether as amicus, attorney ad litem, or in a dual role. The Hon. Debra H. Lehrmann currently serves as a Justice on the Texas Supreme Court. Prior to this appointment, she served as the District Judge of the 360th District Court in Fort Worth, Texas, and served as a family law judge in Tarrant County for over 23 years. A member of Phi Beta Kappa, Judge Lehrmann graduated with high honors from the University of Texas in 1979 and the University of Texas School of Law in 1982. 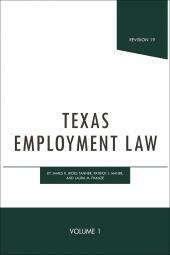 Prior to her appointment to the bench, she practiced family law with the Fort Worth law firm of Law, Snakard & Gambill. She also worked as the lead attorney and director of the Enforcement Division of the Tarrant County Domestic Relations Office. In 1990, she was recognized as the Outstanding Young Lawyer of Tarrant County. Judge Lehrmann currently serves as a commissioner on the National Conference of Commissioners on Uniform State Laws (NCCUSL), where she serves as the Chair of the drafting committee on the Uniform Relocation Act. Since 2003, she has served on the NCCUSL committee which is creating a uniform law on the court-appointed representation of children. She is a past president of the Texas Chapter of the Association of Family and Conciliation Courts (AFCC), is a past president of the Tarrant County Young Lawyers Association, is a master member of the Eldon B. Mahon Inn of Court, serves on the Advisory Board of Tarrant County Dispute Resolution Services, is a fellow of the Texas Bar Foundation and the American Bar Foundation, and is a charter member of the Tarrant County Bar Foundation. An active member of the Family Law Section of the American Bar Association (ABA/FLS), she currently serves as Chair of the section and as the Judicial Liaison to the Judicial Division of the ABA. She previously served as vice-chair and secretary of the section, is a past member of the Family Law Council, the Continuing Legal Education Committee, and the Publications Board, and has served as Chair of the child support committee. From 2000-2003, she was a member of the ABA/FLS Committee to Develop Standards for Representation of Children in Custody Litigation. 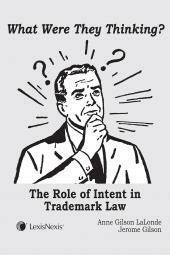 She previously served on the Executive Committee of the Section Officer’s Conference (SOC) of the ABA. In 2005, Judge Lehrmann received the Court Appointed Special Advocates (CASA) Scott Moore Award, and in 2009, she received the Eva Barnes Award for outstanding contributions to the field of family law. She speaks frequently at continuing legal education events throughout the state and country, and lectures on family law at Texas Wesleyan University School of Law. She is widely published, including the 2003 Texas Bar Foundation's Best Bar Journal Article of the Year, The Child's Voice—An Analysis of the Methodology Used to Involve Children in Custody Litigation (Texas Bar Journal, Nov. 2002). She is also the author of Texas Annotated Family Code and Court-Appointed Representation of Children in Texas Family Law Cases (Lexis Nexis- Matthew Bender).